January 26, 2019 — Links International Journal of Socialist Renewal — For over two years we have been told Putin’s Russia has interfered with the 2016 US presidential elections. We now find the US government has decided it can unilaterally invalidate the actual presidential elections in Venezuela and recognize a person of its choosing as president. This is just the latest US-backed coup attempt against a progressive Latin American government, following Venezuela (2002), Haiti (2004, and every subsequent election), Bolivia (2008), Honduras (2009), Ecuador (2010, 2015), Paraguay (2012), and Nicaragua (2018). I will continue to use the full weight of United States economic and diplomatic power to press for the restoration of Venezuelan democracy…. We continue to hold the illegitimate Maduro regime directly responsible for any threats it may pose to the safety of the Venezuelan people. In fact, we may have to go back to Theodore Roosevelt’s creation of the nation of Panama out of Colombia in 1903 to find an appropriate comparison. The US has sought to destroy the Chavista Bolivarian movement since its origins twenty years ago. Obama, in a statement more out of touch with reality than Trump’s, declared Venezuela an “extraordinary threat to the national security” to the United States. Since then, the US has imposed more and more sanctions, even blocking sales of food and medicine to Venezuela. These sanctions cut Venezuela off from refinancing foreign debt, and greatly interfere with its international trade. These brutal economic sanctions are inhuman and illegal under the Organization of American States (OAS) and the United Nations charters. Nicolas Maduro was re-elected President of Venezuela on May 20, 2018 with 67% of the vote. Before the election, during the late spring and summer of 2017, anti-government protesters waged a violent street campaign and the opposition called for immediate presidential elections to terminate the Chavista revolution. This attempted coup came to naught with the turnout in the July vote for the Constituent National Assembly. Then in the fall of 2017 the Chavista government and the opposition began meeting for mediation talks, facilitated by former Prime Minister of Spain Luis Zapatero, in the Dominican Republic. It was eventually agreed to call for early presidential elections, but in the meantime the opposition decisively lost gubernatorial elections and municipal elections. Both the government and opposition were about to sign an accord, but the US intervened and pressured the opposition into abandoning the talks. The US-backed hardliners in the opposition then called for a boycott of the May 2018 presidential election in an attempt to delegitimize the electoral process, but this again failed. Having repeatedly failed to unseat Maduro, the US sought to block his re-inauguration. It began instructing OAS General Secretary Almagro back in spring 2017 to declare Venezuela as a “humanitarian crisis” requiring foreign intervention. This repeatedly failed, as Almagro could never muster a OAS majority. The US then set up the Lima Group, made up of 13 of the more rightwing Latin American governments to orchestrate the destruction of Chavista Venezuela. On August 4, 2018 the US-backed opposition turned to assassination, but failed in a drone attack attempt on Maduro and the military general staff. On January 4, 2019 the US allied Lima Group, with the notable dissent of Mexico, said that it would not recognize Maduro as the president when he was to be inaugurated on January 10. On January 22, the Venezuelan National Assembly adopted a statement accusing Maduro of "usurping" power and declaring all his decisions void. Maduro replied that he would hold the National Assembly accountable for ridiculing the country’s constitution. This National Assembly was held in contempt by the Supreme Court in 2016 after it defied the National Electoral Council and seated legislators whose elections were nullified on the basis of allegations of vote buying. Until the contempt of court determination is resolved, all decisions made by the National Assembly are unconstitutional, null and void. With Trump’s January 23 statement the US has recognized Juan Guaido, the president of the National Assembly, as Venezuela’s head of state just minutes after Guaido self-appointed himself president of Venezuela. Canada, France, Britain, Chile, Colombia, Brazil, Argentina, Paraguay, Guatemala, Costa Rica, Peru and Ecuador followed suit. This interference into the internal affairs of Venezuela is a clear violation of the sovereignty of Venezuela and international laws such as the charters of both the United Nations and the Organization of American States. Russia, Bolivia, Turkey, Iran, China, El Salvador, Cuba, Mexico, Uruguay, and Nicaragua have all made statements in support of Nicolas Maduro as the legitimate president of Venezuela. The Venezuelan military announced it will defend the constitution and national sovereignty, and elected President Maduro. The only way the coup can succeed, as it lacks the support of the Venezuelan military, is with military help from a foreign power, the obvious candidates being the US, Brazil and Colombia. In his January 23 speech (pictures) Maduro gave the US Embassy 72 hours to get out and broke relations with the US over this latest coup attempt. The US puppet “president” Guaido declared Maduro illegitimate and declared the US Embassy can stay. Secretary of State Pompeo stated that Maduro does not “have the legal authority to break diplomatic relations with the United States or to declare our diplomats persona non grata” and vowed to “protect” them. Senator Marco Rubio called on the US to expel Venezuelan diplomatic staff and accept a new set of diplomats appointed by Guaidó. The Guardian quoted Eric Farnsworth, a former US diplomat and vice-president of the Council of the Americas, who said “[Maduro might] turn sharpshooters on crowds and try to scare everybody back home.” This ploy of using sharpshooters to kill demonstrators has become a standard technique the US uses to instigate a coup. We saw it in Venezuela itself in 2002, in Iran 2008, in Syria in 2011, and the Ukraine in 2014. The corporate media would then begin a campaign about the cost of “world” inaction as Maduro allegedly massacres his own people, and the “world” (meaning the US) would be “forced” to intervene. On January 24 the US took to the OAS a declaration to recognize Guaido as the president of Venezuela, but this was again defeated, with 18 voting against and 16 voting for. So far the Maduro government has not arrested Guaido, who is apparently ensconced in the Colombian Embassy. The Chavista governments have periodically displayed indecisiveness during key points in their process, going back to Chavez not jailing the leaders of the failed US coup in 2002. But the oligarchy’s opposition likewise have consistently botched their own plans and discredited themselves even in the eyes of their own supporters. Inside Venezuela, the mobilization of people on the streets is a key determinant of the outcome of this attempted coup. Even though the country has been battered by a severe economic crisis, caused by a major fall in the price of oil, hoarding by private businesses (which still dominate the economy), US and European Union sanctions, corruption, and the ineffective responses of the Maduro government, the Chavistas can mobilize many more on the streets than the oligarchy’s opposition. The opposition itself is plagued by severe divisions between moderates, who prefer to work within the system, and the radicals, backed by the US, who seek to destroy it. The strength of the anti-imperialist feeling amongst the Venezuelan masses should not be underestimated either. Moreover, the military is at least 235,000 strong and the grassroots has about 1.6 million in militias. Washington has already floated the idea of embargoing Venezuelan oil (one-third of US imports), and could even seize CITGO, the Venezuelan owned company. Meanwhile the Democrats and the anti-Trump Resistance, who proclaim Trump a pawn of Russia (which is an ally of Venezuela), have mostly gone mute concerning Trump’s choosing a US puppet as the new “elected” president of Venezuela. Ro Khanna and Alexandria Ocasio-Cortez have also raised some objections. Bernie Sanders issued a more ambivalent statement, as if trying to please everyone. 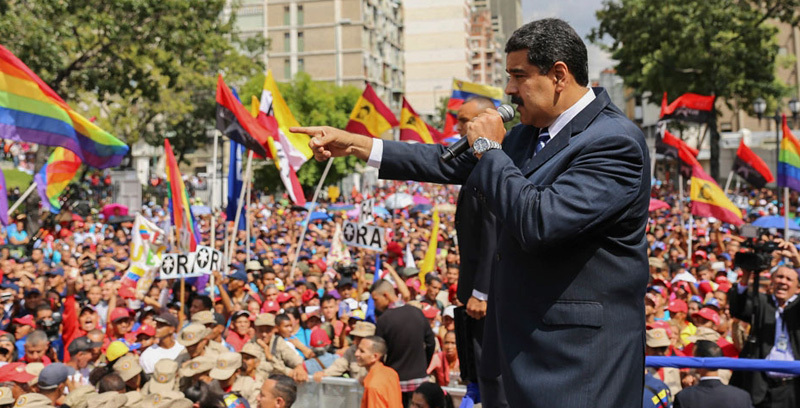 Nicolas Maduro was first elected president in 2013, and the record since then shows the US has unsuccessfully tried to repeatedly unseat him and eradicate the Bolivarian revolution. The record also shows the US and European Union have continually imposed harsher and harsher sanctions on Venezuela, increasing the suffering of the Venezuelan people in the name of “democracy” and “freedom.” Further coup attempts and sanctions are in the works. The peace movement in the US needs to more actively defend Venezuela against US aggressions.